Lose That Girl: WANT IT! Vote for Chuck! Aren't you sick & tired of all the US election nonsense? I'm not even American and I've had more than my fill. Worse still, we're months away from the actual voting day. 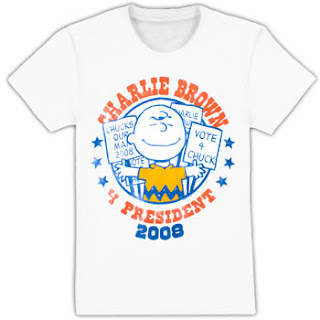 VOTE Charlie Brown for President! And with Snoopy as VP, he just can't do wrong! He's got Linus for a proven speechwriter, and Lucy for his Campaign Chairwoman. Score this tee and make your vote count!